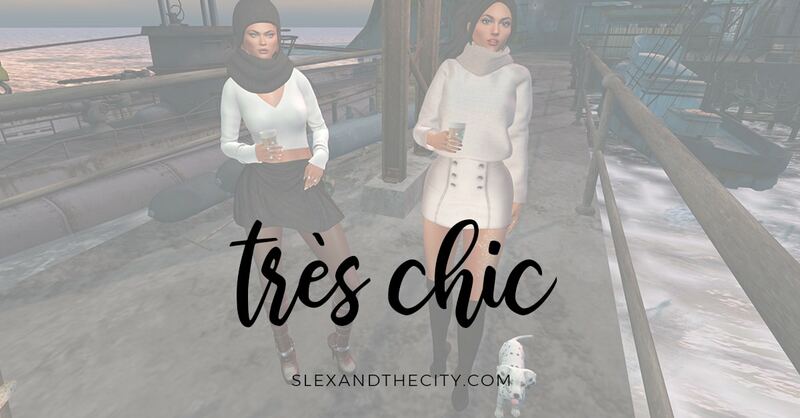 A couple of weeks, I came across something called the (CTS) Wardrobe: Organize your outfits with style! 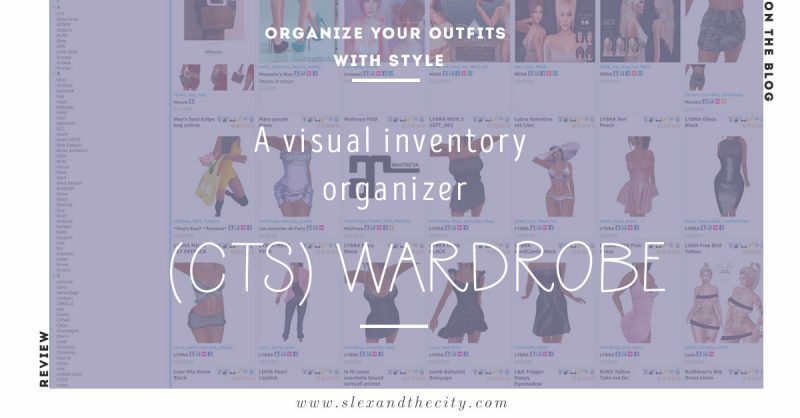 A visual inventory organizer. With a price tag of 699L, it took me a few days before I decided to take the plunge and went on to find reviews about it. Anyone who has lots of patience and time as this is not an overnight process (unless you have nothing else to do or can’t sleep). 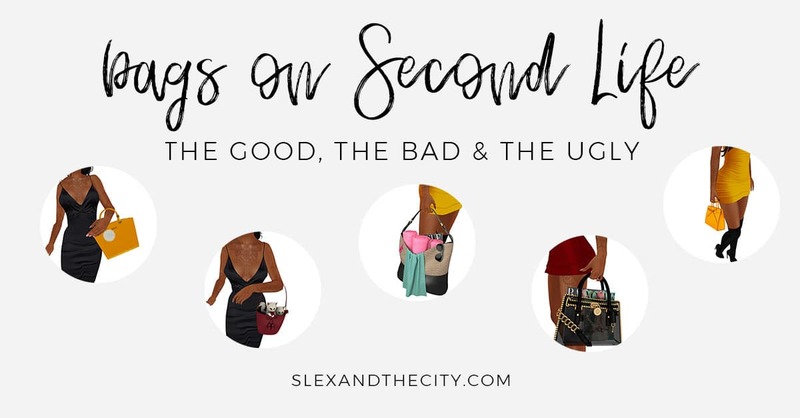 Anyone who wears an outfit more than one or just like to mix and match. If you only wear an outfit once. If you have zero patience and hate tedious tasks. If you’re hoping for a miracle. My decision to buy it was made after watching a video from a YouTube Chanel from Buttacwup Pwincess. After my purchase I watched all Buttacwup Pwincess MyWardrobe tutorials which are great and a must-watch to learn how to use it to its full extant. One of the bad reviews on the MarketPlace is about how it is not magically sorting out your inventory. Warning: although (CTS) Wardrobe is the best thing for your inventory, it’s not a miracle. You still have to sort out your inventory and go through all your items in order to make it work. Once you do this though, oh my gosh, it is the best thing ever, and I can’t imagine my Second Life without it. 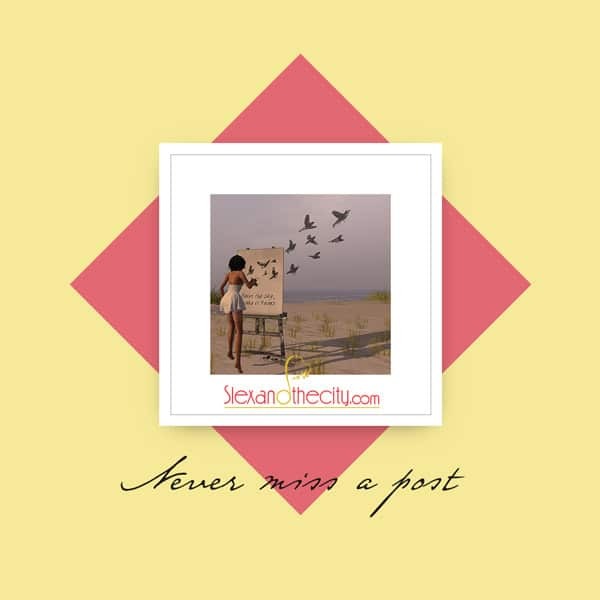 I wish I had found it when I came back to SL and was new to mesh. I deleted most of everything in my inventory, and put the odd stuff I wanted to keep in a folder called “pre-mesh.” It makes sense to add stuff as you buy them, which I do now. This did not happen overtime. At the time of writing, I think I’ve had (CTS) Wardrobe for about two weeks and I’ve been going through my inventory almost every day. I had to figure out my tags so that when I’m searching for something it’s easy to find. 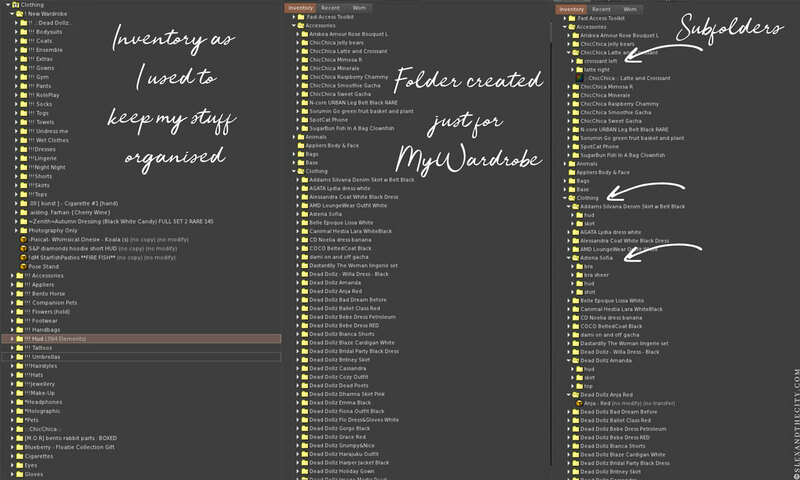 My inventory has approximately 30,000 items at present. In the 30,000 items there are probably lots of useless notecards, landmarks and textures. 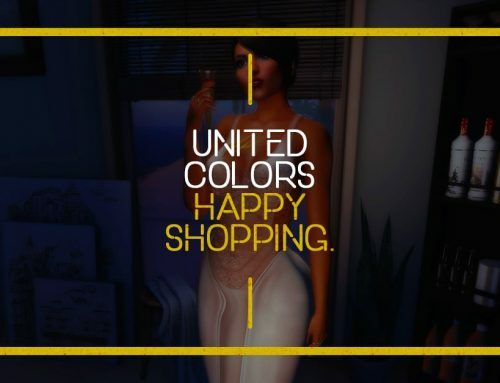 You can add anything to your (CTS) Wardrobe from HUDs for animations or photography to clothes and accessories. I’m working on adding my makeup as I want an easier reference when looking for specific colours. 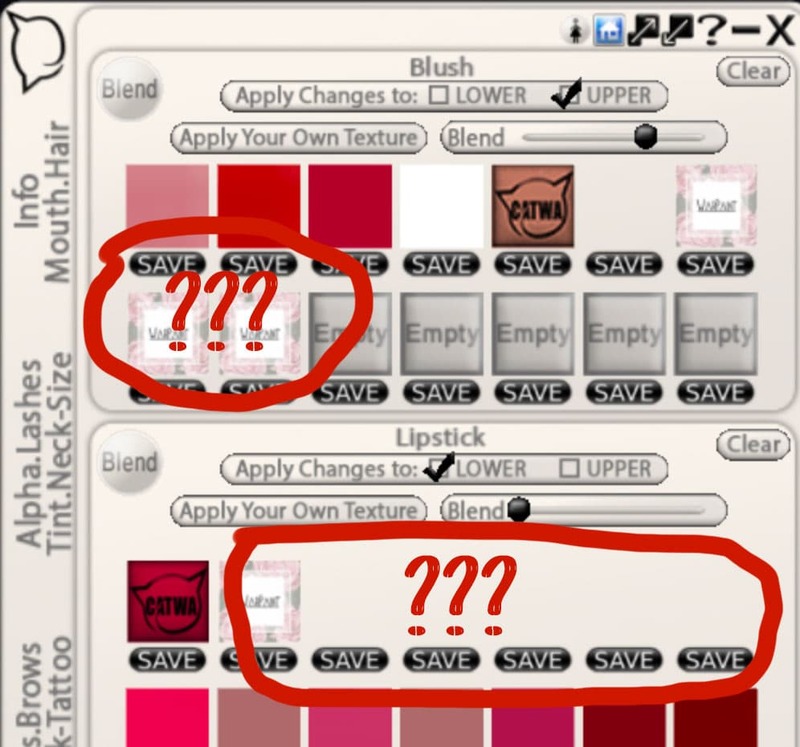 I have some lipsticks and such saved in the Catwa HUD but can’t see a preview of the colours. The same goes with tattoos. I can go with the same one for weeks but sometimes an outfit demands a specific tattoo (eg. backless dress…). I do have some saved in my Maitreya HUD, but, again, with no visual I can never remember which one it is, and it saves ALL layers, so in the end I find it a bit useless. 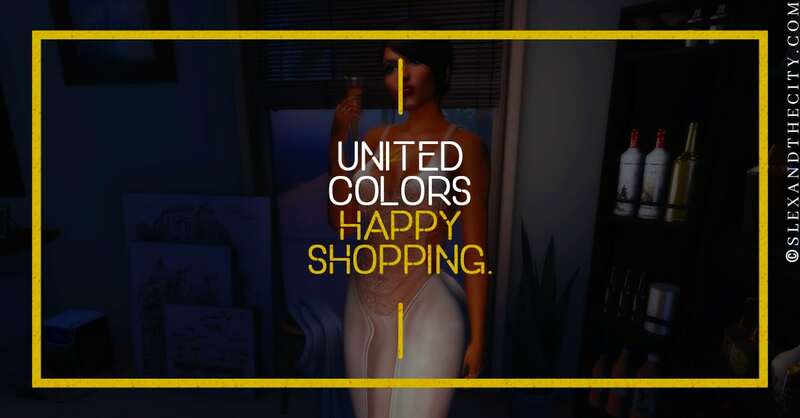 If I’m looking for shoes, I’ll just click on the “shoes” tag and what all I have added is on my screen and with just a few clicks I have shoes on and HUD if I need to choose options. It is that easy. Well. It’s easy once it is set-up. To get there can be quite tedious. First you have to take pictures of everything. Some of the items already have pics so it is a time saver. Some of the vendors though do not allow you to “save as” the texture, so I have to take a screenshot. If the texture is not square, it will not fit properly in the (CTS) Wardrobe preview so I have to modify them with Photoshop. 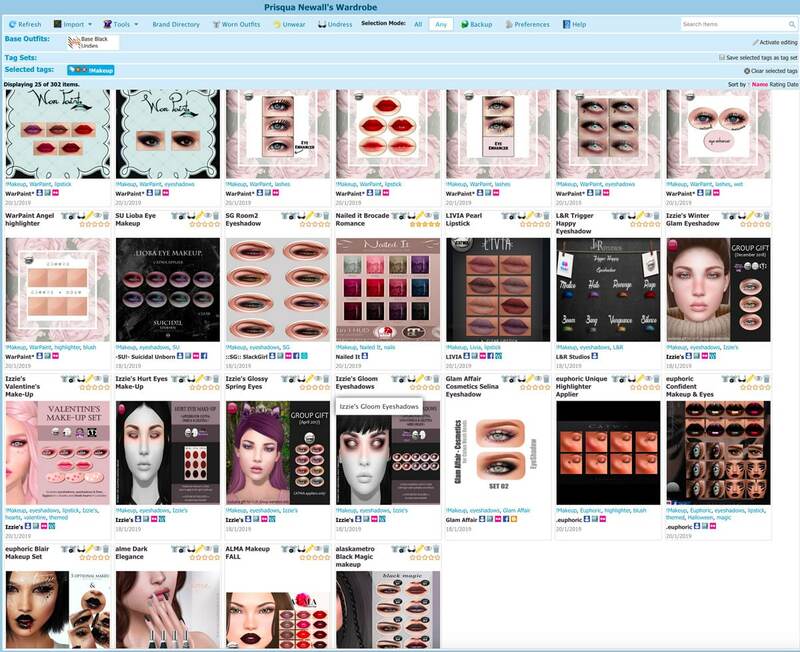 You can add up to four pictures per items you set up. The (CTS) Wardrobe comes with a photo stand. The poses are not all that great but it’s enough to serve its purpose. The next most tedious part is having to create folders and sub-folders. I added an outfit yesterday that has no HUD. Each colour is a separate item, so had to create 20 sub-folders, 10 for the skirts and 10 for the tops… I did say tedious, right? I don’t add everything. In fact, I have deleted quite a few items. Some of the stuff I kept “just in case”, but it’s very unlikely I will wear them, so I couldn’t be bothered to add them. My inventory is kinda organised anyway. You can also go “wild” with your inventory. For instance, I tend to be lazy to wear anything that uses an Omega relay, not that I have many things using them. One of my favorite tattoos is by Fallen Gods and needs the Catwa Omega relay and the Maitreya Omega relay. When setting up my sub-folders, I separated face and body HUDs and added a link to their corresponding Omega relay. 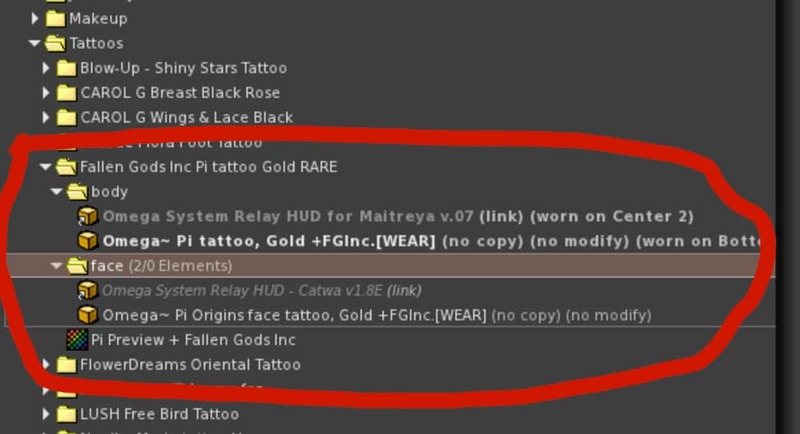 If I click on wear what’s inside the body folder, the HUD for the tattoo will be added as well as the Omega relays. Once I’m done, I click on take-off and all the HUDs are gone. With (CTS) Wardrobe, it is just so easy to see your clothes and accessories at one glance. I absolutely love it and highly recommend it. 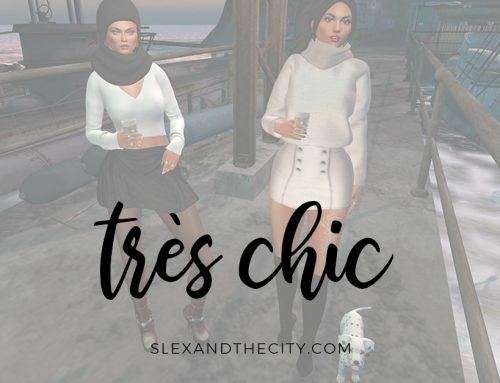 Are you ready to get your (CTS) Wardrobe? If you do, let me know your thoughts about it, or, if not, why not? 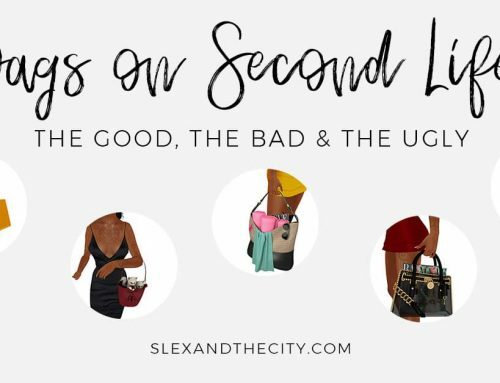 Official (CTS) Wardrobe website page with links to tutorials and other related info.